It’s safe to say that many people don’t know about the existence of deep sea corals. A new video series 'Jewels of the Gulf' created by the ECOGIG outreach office in collaboration with Allison Randolph, filmmaker and ocean conservation advocate, aims to change that. During the 12-day ECOGIG 'Jewels of the Gulf' expedition in June 2017, ‘Ocean Allison’ and ECOGIG's Emily Davenport collected footage of the ECOGIG scientists and collaborators hard at work on the summer expedition, including video interviews with chief scientists Dr. Iliana Baums (PSU), Dr. Chuck Fisher (PSU), ECOGIG collaborators Dr. Amanda Demopolous (USGS), Dr. Santiago Herrera (Lehigh), and several graduate students and postdoctoral associates. 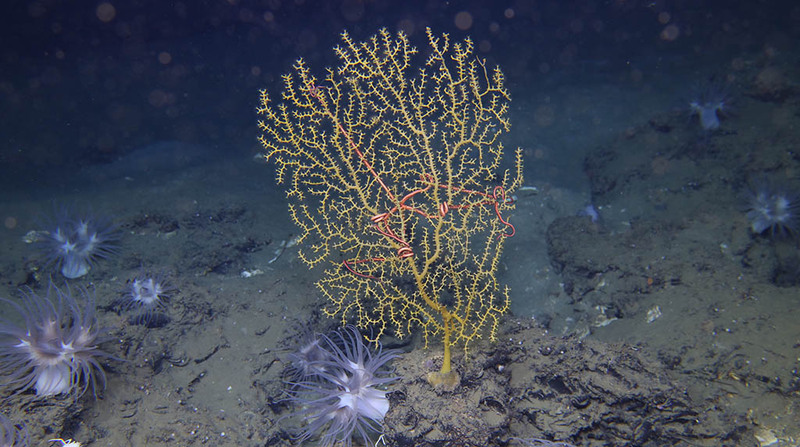 The videos were an opportunity to highlight not only what deep sea corals are, but also how they are studied and why it’s important to study them. The ECOGIG work with corals takes a novel and intriguing approach that relies on time-series imaging of the corals to monitor their response and recovery after the Deepwater Horizon oil spill. High-resolution cameras mounted on a remotely operated vehicle are used to capture hundreds of still images of individual deep sea corals that have been monitored year after year since the spill. In addition to coral monitoring, ECOGIG team members seek to improve the understanding of how corals and their associates respond to natural hydrocarbon seeps (areas of the seafloor where natural oil and gas-rich fluids seep into the ocean). This research has implications that may inform management responses to anthropogenic hydrocarbon releases. The Jewels of the Gulf videos are for broad public distribution and will be incorporated into the ECOGIG education and outreach program, including the Ocean Discovery Summer Camp, classroom visits, and Ocean Discovery Zone engagements at science festivals and football pre-game “Science at the Stadium” events. The videos will be made available through the ECOGIG website and all ECOGIG social media channels, including Facebook, Instagram, Twitter, YouTube, and Vimeo. A 16-minute short documentary about the expedition has also been released and is being submitted to film festivals. See it here!